Description: The big star on the Venus Records' roster and one of the top tenor saxophonists of his generation, Eric Alexander's latest release is a Latin jazz album. Leading his regular quartet consisting of the powerful Harold Mabern on piano, Nat Reeves on bass and Joe Farnsworth on drums, Alexander blows his powerful horn on the bossa nova and Cuban rhythms. The choices of tunes are varied and interesting, including Horgy Carmichael's "Two Sleepy People," and Cole Porter's "So In Love" along with an Afro-Cuban staple "Manteca" and bossa nova classics such as "Corcovado" and the title track. A fine outing by one of today's best jazz groups! During the past 25 years, Eric Alexander has been a major tenor-saxophonist and one of the most consistent of all jazz musicians. He has always had a large tone and a style that mixes together hints of Sonny Stitt, Dexter Gordon and Joe Henderson with his own strong musical personality. Alexander gained initial attention for coming in second place at the 1991 Thelonious Monk Saxophone Competition. Within a year he was recording as a bandleader and he has since led many record dates including a notable series for the Venus label since 2004. While Alexander has recorded with many artists, he has led his quartet with pianist Harold Mabern, bassist Nat Reeves and drummer Joe Farnsworth since the late 1990s. After all of that activity, one would not be surprised if Eric Alexander took it a bit easy on his record dates, but the opposite is true. His playing on Recado Bossa Nova is very passionate and he constantly stretches himself. When one looks at the song titles, which include "Two Sleepy People," "Corcovado" and "Here's That Rainy Day," it would be unexpected if the result was a relaxed set of bossa-nova. However, with the exception of one slightly slower song ("Journey"), all of the music is high-powered, taken at a fast pace, and full of energetic playing. There may be bossa nova rhythms on some of the selections (while a few others utilize Afro-Cuban rhythms) but the playing is forward-looking straight ahead jazz. The first half of the program is comprised of an uptempo version of Hoagy Carmichael's "Two Sleepy People" (a swing standard normally taken at a slow pace), Mario Bauza's classic "Mambo Inn," (listen to the tenor's stirring double-time lines), a rare small-group version of "Manteca," and "Corcovado" which often has Alexander referring to Joe Henderson. His playing is quite intense on "Recado Bossa Nova," he comes up with fresh variations over the steady bossa beat on "Here's That Rainy Day," Alexander does not lessen his passion on the more mellow "Journey" and he wraps up the set with many creative ideas on "So In Love." Harold Mabern creates many inventive improvisations (his chordal solo on "Mambo Inn" perfectly fits the performance) while Nat Reeves and Joe Farnsworth keep the momentum of the music flowing. 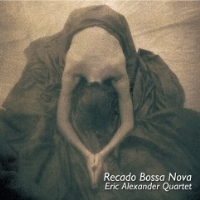 Even with his large discography, Recado Bossa Nova is one of the most exciting of all Eric Alexander recordings.